from tlie Ruler of Qatar. in the Name of God the Merciful and Gracious. From:- Abdullah ibn Oasim ath Thani, Ruler of Qatar. 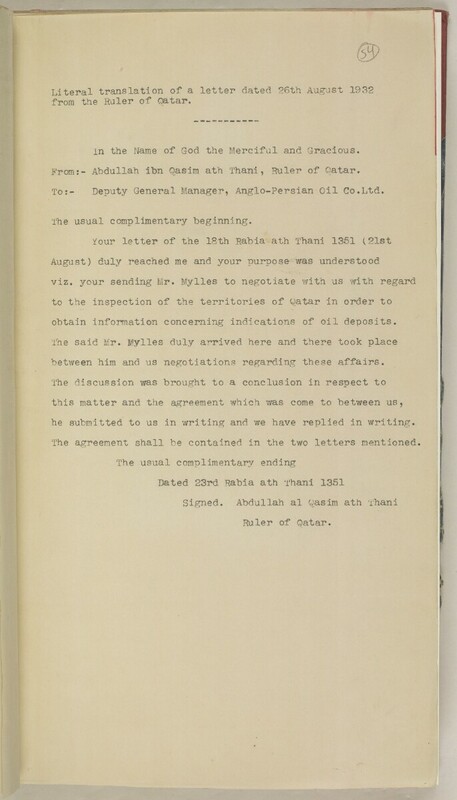 To:- Deputy General Manager, Anglo-Persian Oil Co.Ltd. obtain information concerning indications of oil deposits. between him and us negotiations regarding these affairs. he submitted to us in writing and we have replied in writing. The agreement shall be contained in the two letters mentioned.